This is a great side dish that can be paired with almost any main course meal! This is one of our all-time favorites, so why not try it out and let us know what you think. First we make the brown sugar drizzle. Place the brown sugar, butter, soy sauce/Worcestershire, and garlic salt in a small sauce pan on low heat. Melt the butter so it creates a glaze, stirring occasionally so that it doesn’t begin to stick on the bottom. This usually takes between 7 to 10 minutes. Next, the bundles. 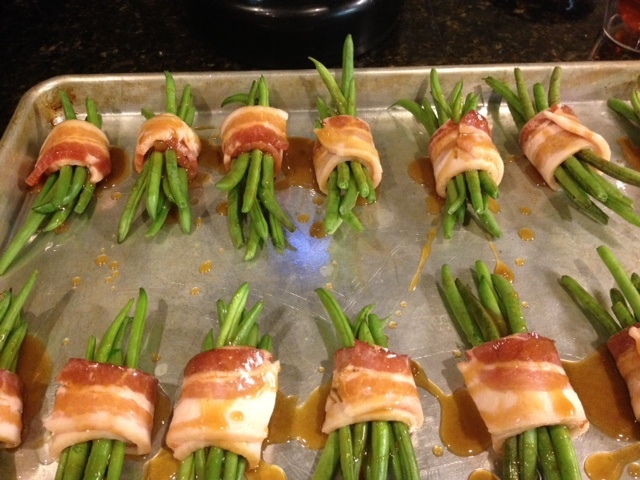 Cut each bacon slice in half and wrap around a handful of green beans. We usually do 5-7 green beans per bundle. Place on a baking sheet and drizzle the finished glaze over each bundle. Place the baking sheet in a preheated oven at 350*F. Cook for about 25 minutes. To crisp the bacon up a little bit more, turn the oven to a broil for 5 additional minutes. Let sit and cool for a couple minutes. Then plate away! 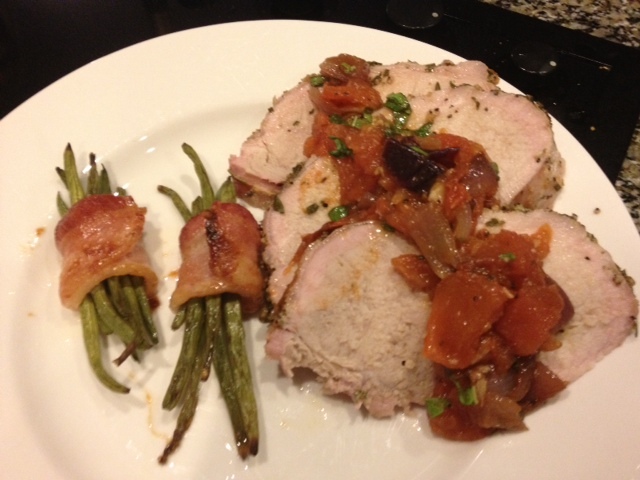 A good main course to pair with these bundles is our Herb-Crusted Pork Tenderloin with Roasted Tomato-Garlic Sauce. You can find that recipe here!! This entry was posted in Cooking, Family, Food, Side Dish, Uncategorized and tagged bacon, brown sugar, cooking, delicious, dinner, family, fun, green beans, recipes, side dish, wine, wine & dine. Bookmark the permalink.